The CA3420 is an integrated circuit Operational Amplifier that combines PMOS Transistors and Bipolar Transistors on a single monolithic chip. The CA3420 BiMOS Operational Amplifier features Gate protected PMOS Transistors in the input circuit to provide very high input impedance, very low input currents (less than 1pA). The internal bootstrapping network features a unique guardbanding technique for reducing the doubling of leakage current for every 10oC increase in temperature. 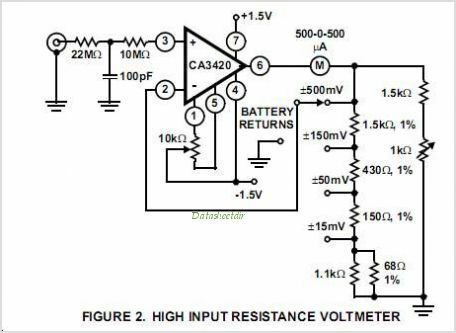 The CA3420 operates at total supply voltages from 2V to 20V either single or dual supply. This Operational Amplifier is internally phase compensated to achieve stable operation in the unity gain follower configuration. Additionally, it has access terminals for a supplementary external capacitor if additional frequency rolloff is desired. Terminals are also provided for use in applications requiring input offset voltage nulling. The use of PMOS in the input stage results in common mode input voltage capability down to 0.45V below the negative supply terminal, an important attribute for single supply application. The output stage uses a feedback OTA type Amplifier that CAN swing essentially from Rail-to-Rail The output driving current of 1.5mA (Min) is provided by using nonlinear current mirrors. This is one package pinout of CA3420,If you need more pinouts please download CA3420's pdf datasheet. This is one application circuit of CA3420,If you need more circuits,please download CA3420's pdf datasheet.